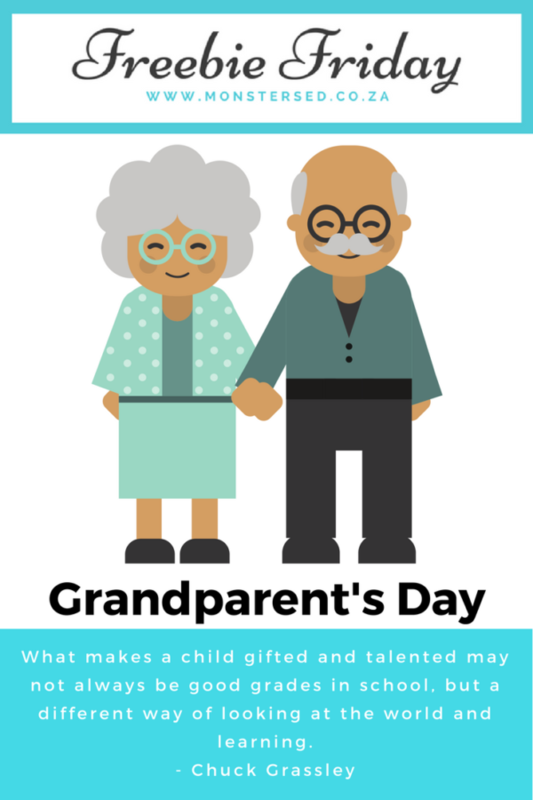 Grandparents Day is on Sunday, here are some really cute, and free, activities for you to work on with your children, or grandchildren, to make the day a little extra special. 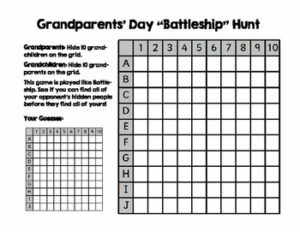 This is a play on the game of Battleship that can be used for Grandparents’ Day. The grandparents hide “grandchildren” on the grid and the grandchildren hid “grandparents” on the grid. The goal is to see who can find all of the people first! 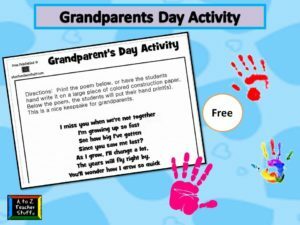 Use this poem along with the child’s handprints to give to grandparents. 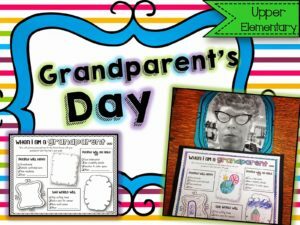 The grandparents got such a kick out of these and the students loved working on them together with the grandparents as well! 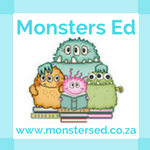 It worked out to be a great way to connect and discuss about the past and the future. 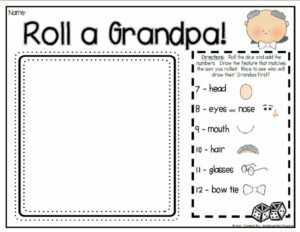 We modeled how to play “Roll a Grandpa/Grandma” with our kiddos for morning work. We planned on playing with our g’parents if we had some extra time…which we did…so that turned out great! 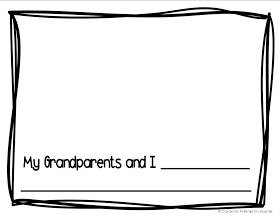 The kiddos gave their grandparents their coupon books and poems and then they played “Roll a Grandpa/Grandma”. It was so stinkin’ precious watching our grandparents pile up on the floor, at the tables, anywhere they could find—and play this game with their littles! I swear we were smiling from ear to ear watching them! And as you can see from the time frame above—we MAAAYBE went a WEE bit over the predetermined time allotment! I am telling you…they DIDN’T WANT TO LEAVE!!! 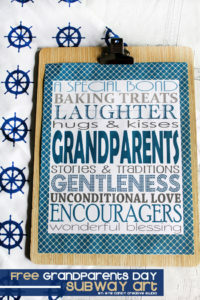 Do you have a special Grandma? 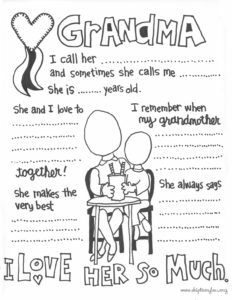 This darling Grandma Coloring Page is the perfect way to let her know exactly what you love about her. There is just enough space to share what she says, what she is good at and what you like to do together. 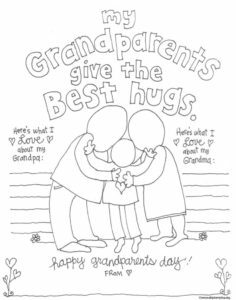 This darling Grandparent coloring pages will let your child show their grandparents how special they are! 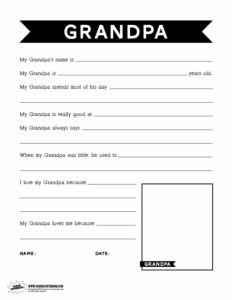 Download the free Grandparent coloring page, print and color! Too cute! 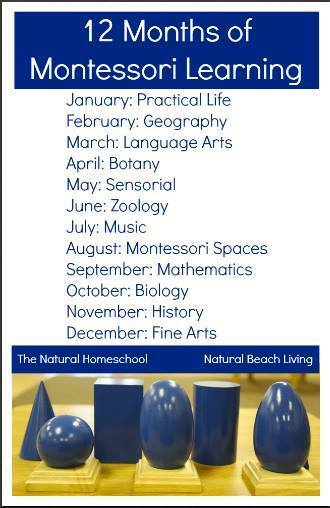 Grandparents Day is coming . . . and SOON. Grandparents . 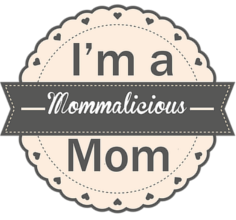 . . they are such wonderful blessings! 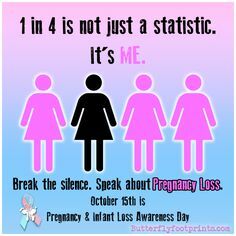 I unfortunately do not have any of mine around anymore however my daughter is lucky enough to have all of hers so this is perfect for her and anyone else who is fortunate enough to be able to spend time with and see theirs when they can. 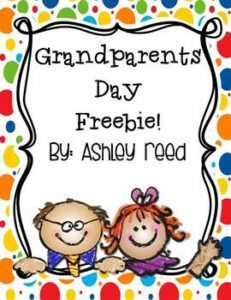 Click here to view our previous Grandparents Day Freebie Friday post.